This urban bench inhibits damage of trees, provides a location for bike locking; and allows people an alternative to sitting on curbs, fire hydrants, and ledges. The second model focuses on the protection of the trees and place for bikes to lock. Abandoned is a common, if not inevitable, part of an object’s life in the city. When things get too old or unworthy of use, they are thrown to the curb. Many people may see this as just a part of the consumerism cycle, while others see the left behind objects as having character. Two fellow designers (Mark Scafini and Kuzey Taran) and I found this as a design opportunity. We traveled around the city, particularly on trash night, searching the curbs for useful items. We consistently found furniture pieces, especially chairs, just waiting for us. The more we looked, the more we found. We began to build up a large collection of chairs and other miscellaneous objects. 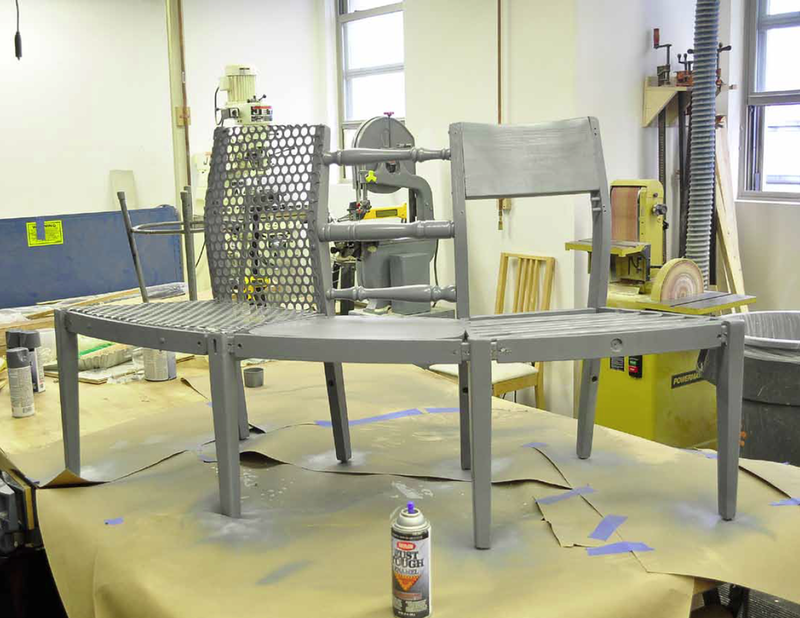 Within our process we decided to work with our hands, "frankensteining" chairs together to stimulate possibilities. Our chair hunts kept us busy thinking about what issues we could address with the stockpile of material. While maintaining an alertness for chairs, in contrast, we noticed a lack of seating in more densely populated areas. The most common place of seating absence was at bus stops. People, particularly the elderly, would lean against buildings, sit against a thin ledge, or endure sitting on standpipes. Many people could also be seen standing outside of stores or restaurants leaning against bike racks and locked bikes, waiting for someone. 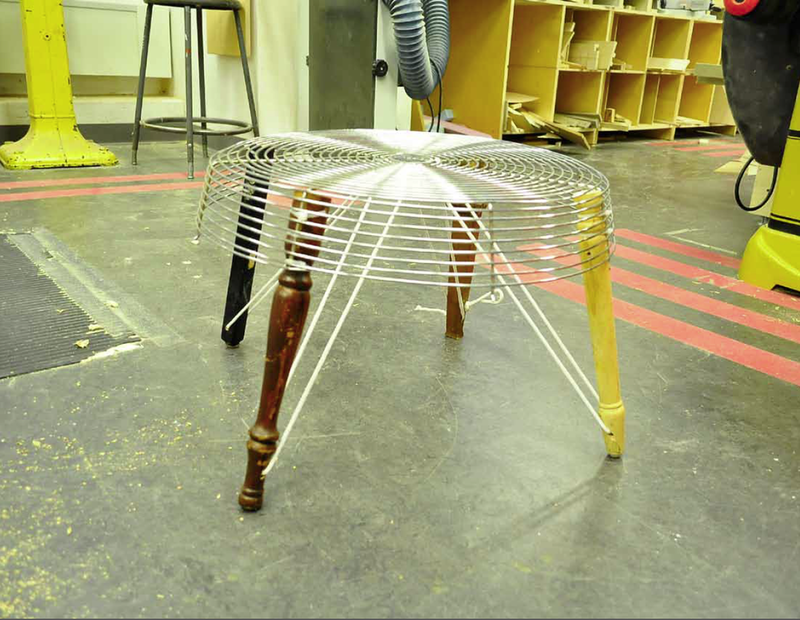 Prototype testing: This model addresses the use of standpipes as a place to sit. It clasps to a vertical pipe and curves 90 degrees to then provide a connection for a seating structure. 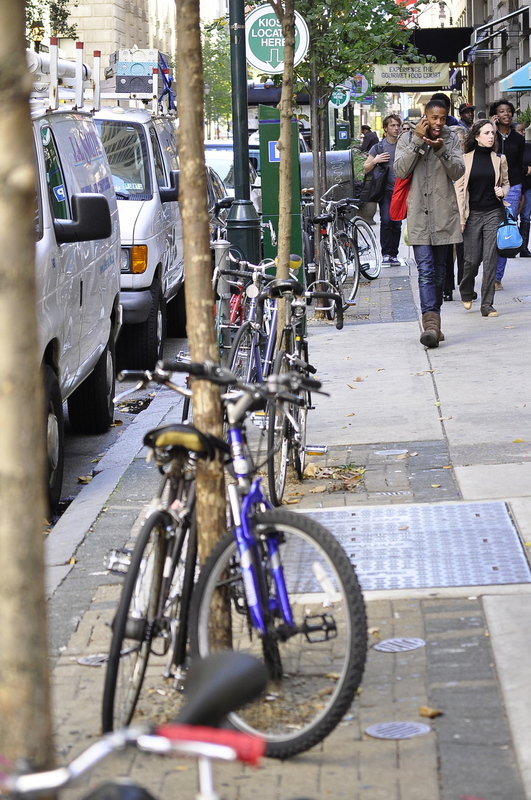 The abundance of bikes in Philadelphia has led to a shortage of places to lock one’s bike. People resort to locking their bikes on fences, signs, railings, and the most unfortunate, trees. These trees are young, perfect for a “U” shaped bike lock to clutch onto. This was causing serious damage to the trees, leaving areas of the trunk chipped away of its bark. We immediately recognized this as a point of entry to utilize our collection of chairs. We could both manipulate the chairs as protection for the trees, as well as provide a place to sit for those who need it. Even with a fully open bike rack, the young trees are still subject to bike locking. Case in point, the young trees are consistently locked to without an alternative. We began with an assortment of sketches, externalizing our thoughts onto paper. Taking what we had drawn, we hacked the chairs apart to construct them to our needs. Philadelphia is a city with immense history, especially when it comes to the Industrial Revolution. The city housed all types of factories and manufacturing. We wanted to display aesthetics alongside vernacular of the city through the pieces we chose to combine. A collection of sketches to understand our intent. We created two final prototypes with this in mind; each coexist with similar purposes. The first addressed the seating issue, providing three sections for sitting. It also curved the partial circumference of the tree, discouraging and preventing bikers to lock to it. The second piece invites bike locks and protects the trees by fully wrapping around; it did not provide seating to allow variation to the first design along the sidewalk. Throughout later prototyping and testing, we contacted the Center City District of Philadelphia to receive feedback on our intent and the feasibility. We were pleased to receive positive reactions and encouragement to push our work further. Once we had created a more finalized prototype and tested it, we reached out once again. Feasibility increased and our work was being shared within the department. The woman we spoke with also solidified our findings, reaffirming that the small trees were dying from bikes being locked to them. Objects in the streets, relentlessly left by their previous owner, truly can be a treasure waiting to be found, or in our case, a design solution not yet realized.